There was no mistaking this year’s winner of the Miss Maine Basketball award. 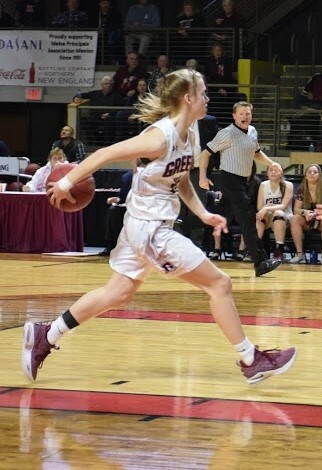 Anna DeWolfe showed exceptional skill in every facet of the game from the moment she stepped on the court her freshman year, and made history at Greely High School. A four-time Western Maine Conference all-star, she led the league in scoring (27.8), assists (5.8) and steals (4.5) this season while leading her team to an undefeated 22-0 season. Anna also was the recipient of the Western Maine Conference, Bob Butler Award and the outstanding player in the Regional Finals as well as a team Captain for 3 years. The 5’7″ guard became the second Greely girls player to cross the 1,000 career-point threshold and became the schools all time leading scorer with 1948 career points. Anna led the Rangers to 2 consecutive Gold Balls in her Junior and Senior year while making it deep into the playoffs all 4 years of her career. The daughter of Frank and Serina DeWolfe, Anna will continue her career and play Division 1 basketball at Fordham University on scholarship. Congratulations to Anna for an outstanding four years at Greely and leaving an incredible mark on the program and community .